This is a major purchase in the life of a media ministry, so we’ve compiled a worship presentation software buyer’s guide. We’ve got five of the latest makes and models listed here, with all of the technical info in one spot. In addition to the usual stuff such as features, system requirements, tech support, pricing and demos, we asked users of our Midnight Oil Metaphorum to give us feedback for each program. Within each program’s description are real human beings talking about their experiences. EasyWorship 2007 is the latest release from Softouch Development, Inc. of Tulsa OK. The company’s primary focus for the product as stated by lead developer Jeff Taylor is to “continue to make EasyWorship the best projection software product on the market. We want churches to have a viable, quick, stable, feature rich, easy-to-use solution for a reasonable price.” As the name suggests, EasyWorship’s creators value ease of use. Softouch Development currently ships EasyWorship 2007 for Windows Vista, XP, 2000, ME and 98SE users. A Macintosh version is being considered. Softouch recommends a 1.7 GHz P4 processor, with at least 256 MB memory, 100 MB of free space on your hard drive, a DVD drive, and two graphics card with 128 MB of video RAM. Of course, a bigger hard drive and more memory will equate to a better experience. The website at http://www.easyworship.com features a knowledge base, FAQ, a well-populated forum, a dusty blog, email, phone and live online support. EasyWorship retails for $399, and is sometimes available for less, at a number of retailers. 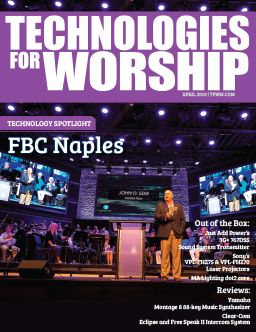 While the other four programs included in this survey have more history and are considered by some to be the industry’s top options, we’ve included LiveWorship because of its currently unique cross-platform capabilities. (That is techno-jargon for, “it works on Windows and Macintosh computers.”) If you’re working in a Macintosh-based or multi-platform environment, then this may be the option for you. 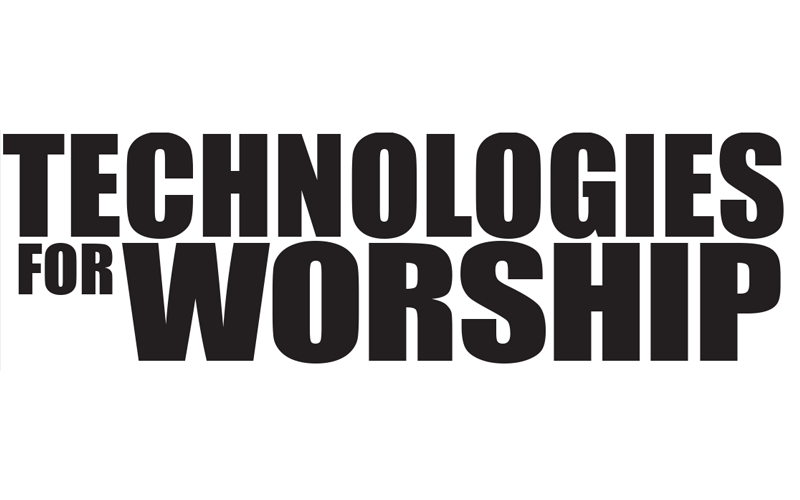 LiveWorship was introduced publicly in September 2005 at the National Youth Worker’s convention, and is produced by Horizon Technology of Chillicothe OH. The current cross-platform version is 1.3 and includes universal binary support for Intel Macs. As of this writing LiveWorship is not Vista compatible and there is no news about a pending update. Alan Miles is Media Director at Trietsch Memorial UMC in Flower Mound, TX where he and his team use LiveWorship weekly. He says, “I chose LiveWorship because of its simplicity and ease-of-use. From importing graphics and backgrounds, to playing videos, to organizing worship services and songs, you could not ask for better presentation software for the Mac. The layout is clean and simple and very intuitive. We also like being able to make changes to the presentation while we are live. If the pastor calls for something while he is talking, we can quickly add it in if it is something we aren’t expecting. “We just switched systems and our old song database was not compatible with our new computers; so LiveWorship really helped us out by having a large song library already built into it. Plus, we could add songs and manage, organize and access them very effortlessly. LiveWorship 1.3 retails for $309 if you like owning a disc on your shelf, or $299 for the downloadable version, through the company website at http://www.liveworship.com/catalog/?src=midnightoiltfwm. A demo version is available through their site at http://www.liveworship.com/demo.html. MediaShout is the flagship product of MediaComplete Corporation, a company started by three partners in Nashville in 1999, and now consisting of more than 20 employees dedicated to assisting media ministers and volunteers in worship. MediaShout currently ships 3.2 for Windows Vista and XP users. As for technical mumbo-jumbo: MediaShout 3.2 is for PC-compatible systems only. It works best in a dual-display configuration with around 128 MB VRAM on the second display card. You’ll want to drive it on at least an Intel Pentium 2 GHz system, but preferably 3 GHz; with at least 512 MB RAM (although we’d recommend 1 GB); a DVD drive in your PC, and lots of space on your hard drive for your soon to be large library of media. Metaphorum user and good friend Phil Graves, media coordinator for the Baptist Convention of MD/DE, states, “I have been using MediaShout for almost 5 years and have come to rely on it on a weekly basis. Not only do I use it for my church’s weekend service, but also anytime I do a presentation. It is flexible in that I can edit my presentation on the fly and there is hardly any media file type I cannot get it to play. Of all the worship software packages on the market, I find MediaShout to be the most robust.” In the interest of full disclosure, Phil also says he likes the program so much now that he sells it. The MediaShout website www.mediashout.com has a user guide, screen demos, version updates, a knowledgebase and extensive user forums online to enhance your ability to use the program. Additionally, unlimited phone and email support is available. MediaShout Version 3.2 retails for $429 but is readily available for $399 at a number of retailers. MediaComplete also continues to offer version 2.5 for non-XP users, but if you’re going to spend $400 on software shouldn’t you get a rockin’ system to go with it? As with the others, take it for a 30-day spin at http://mediashout.com/try/30_ev.cfm/?src=midnightoiltfwm. SongShow Plus is the brainchild of Doug Reece, a software developer in Boise ID. Doug is the founder of R-Technics, Inc. and the creator of SongShow Plus (SSP), a program he developed in a local congregation in the 1990s out of a desire to use a more sophisticated option than PowerPoint. Ten years after the initial release, SongShow Plus is shipping version 7. This mature program touts seamless presentation of songs lyrics, scripture text, sermon notes, announcements, digital pictures, videos files, live video and more. SSP emphasizes the user’s experience this time with an improved user interface with customizable colors and multiple layouts; a new user guide and step-by-step, illustrated tutorials; and more included motion backgrounds. Among other features, new to version 7, professional edition, is a feature called Video Chain that allows the user to play and even loop multiple video files, which can be handy with announcement loops. All current subscribers have access to technical support persons through SongShow Plus’ partner, GoFishMedia, LLC. Also available is the user forum at http://ssplash.com. This forum has a user guide, a knowledgebase and extensive user forums, as well as phone and email support. Joel also points out that the online community for SongShow Plus has a wish list where members can vote on additional enhancements they would like to see in future versions SSP. SongShow Plus 7 comes in a basic edition for $349.95 or a professional edition for $499.95 through their website at http://www.songshowplus.com/?src=midnightoiltfwm. A fully working, 60-day demo is available. Go to http://www.songshowplus.com/Download for more details. Grass Roots Software of Grass Valley, CA, creates SundayPlus. Originally called Prologue Worship Leader, then Prologue SundayPlus, SundayPlus started as a custom-built presentation program for the Promise Keepers events in 1998. Next to SongShow Plus, it is the longest-running application in this review. It has been unique in its creative, graphical interface, which we have liked as right-brain types. Unfortunately there have been no new updates to the program in 3 years while the company has focused on a newer presentation program called Freepath. One advantage of an older version of software is that the technical requirements are modest. SundayPlus works on any Windows OS from 98 to XP, using a 1 GHz P3 or newer processor, at least 512 MB of memory, dual monitor support, and a CD-ROM drive. No Vista support is available at this time. Tech support for SundayPlus is extensive at http://sundayplus.com/support.html and includes updates and patches, a knowledge base, a quick reference guide in PDF format, a well-stocked forum of user discussions, and a number of tutorials. Email and phone tech support is also available. SundayPlus 2.4 pricing starts for a newly reduced price of $349 with options up to $499 at various resellers. The requisite, fully working, 30-day demo is available at http://sundayplus.com/demo_req.html. When we asked for feedback from our forum users, we got a thorough response from Bill Aumack of Downey-Florence Seventh-day Adventist Church in Downey, CA. Bill described their evaluation process and has some good pointers for congregations ready to make a similar move. Bill states, “Like many churches we started our media experience with PowerPoint. When we needed more features, we started by listing the features that we thought were important that were missing from PowerPoint. We read every review and article we could find. 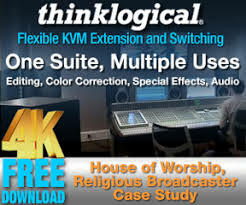 One of the great features of worship presentation software is they all allow some type of trial. We installed them all and evaluated them as well. [note: Budget minded? There’s 5 months of free software!] This is an important step that everyone who is thinking about changing systems should do. Nothing says more about the software than actually trying it on your own system. “One of the features that was important to us was to have one presentation system that could display announcements, songs and sermon points. We didn’t want to use PowerPoint for half of the service and switch to another system for the other part of the service. This one feature greatly reduced the number of entries in our decision process. Eventually SongShow Plus was selected as the system that best met our needs. While Bill chose SongShow Plus, other congregations employing just as thorough of a process came to the conclusion to purchase EasyWorship, MediaShout, LiveWorship, and SundayPlus. As you can see, there’s no one-word answer. If you are still using PowerPoint and are just now considering a move to something more sophisticated in worship, don’t worry. While the move could reap great rewards for you, you’re not too far behind the curve. For an interesting perspective, check out a presentation software poll at churchmedia.net, here: http://www.churchmedia.net/CMN/cmn-polls/9488-new-software-do-you-use.html. You will notice that even in a highly technical forum, there are still quite a few PowerPoint users. We bet a lot of people continued to hand crank their Model A Fords after self-starting automobiles came out, too. So go get behind the wheel and start test-driving these powerful new machines for worship today.